The trip was originally planned to be in the Sierras – Yosemite (the other “Y” park), Kings Canyon, Sequoia. But fires, lingering smoke, closures, and little water in the streams for backpacking led to Plan B, the coast. 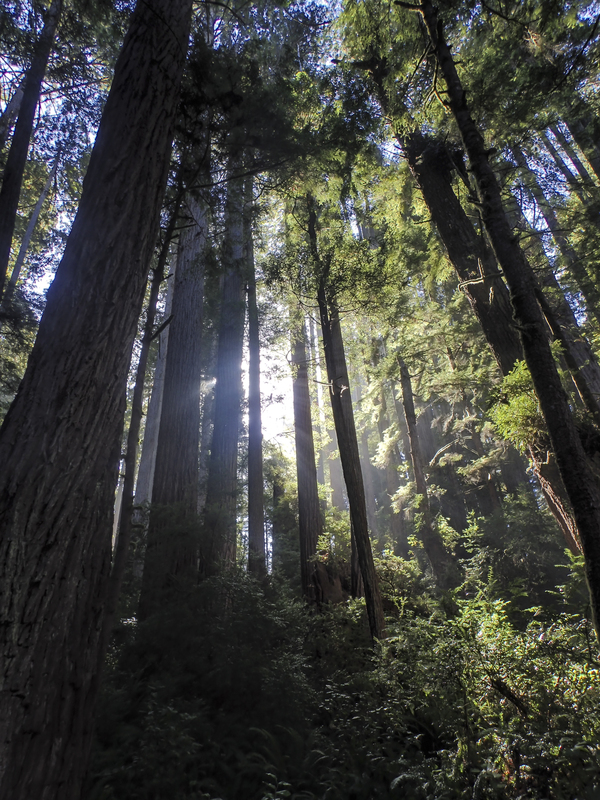 The first part was in the redwood forests – mesmerizing, spellbinding, otherworldly. 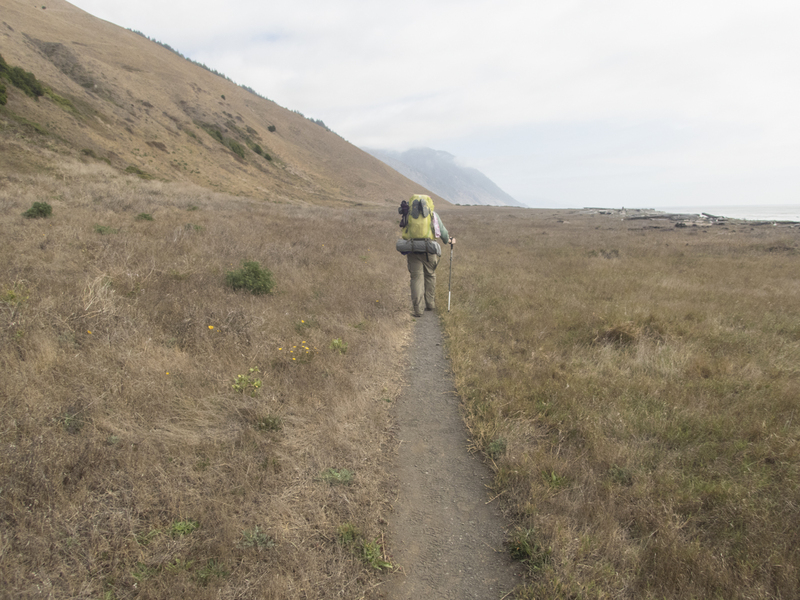 The last part was more challenging, a multi-day backpacking trip along the Lost Coast Trail (LCT). The trail runs through portions of the King Range National Conservation Area in Humboldt and Mendocino Counties in northern California. 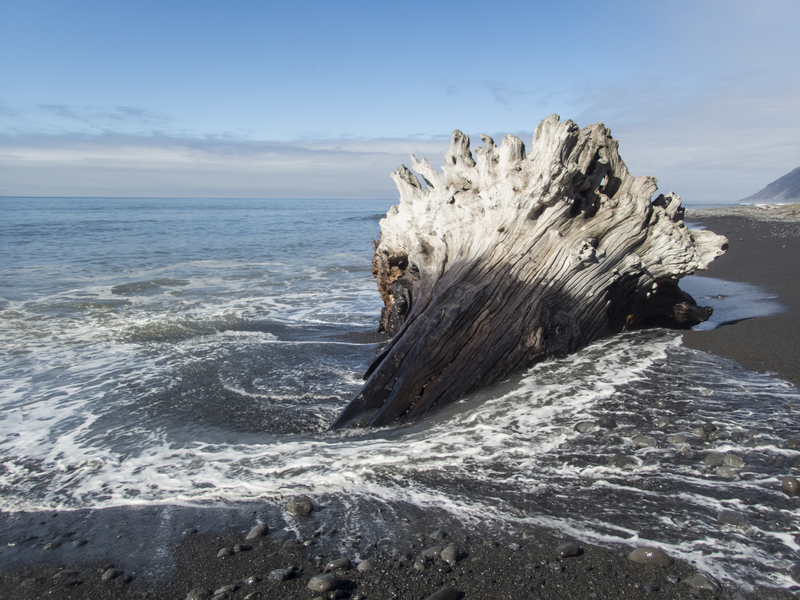 Due to the rugged terrain and unstable geology of the King Range, California’s famed coastal Highway 1, which hugs much of the state’s beautiful coastline, cuts inland along the Lost Coast, leaving an 80 mile stretch of coastline with no major roads. The area is sparsely populated and the roads are steep and winding as we found out on our early morning shuttle ride from Shelter Cove (on the south end of our trail section) to the starting point up north at Mattole Beach. Even though the straight line distance is only 25 miles, it takes about an hour and a half by car. But, the shuttle is worth the pricey cost. You have your car waiting for you at the end of your hike plus you get a lot of good local information from the driver on the way. Our shuttle ride began in the predawn darkness at 6:30 a.m. so we could get an early start at the Mattole Beach trail head. Most people walk this section of trail north to south, like we were doing, because the oftentimes strong coastal winds will generally be at your back in this direction…generally. Our day started with a steady 15+ mph wind in our face. And it stayed that way all day and into the night, with occasional gusts much higher. At least it made for cooler hiking. 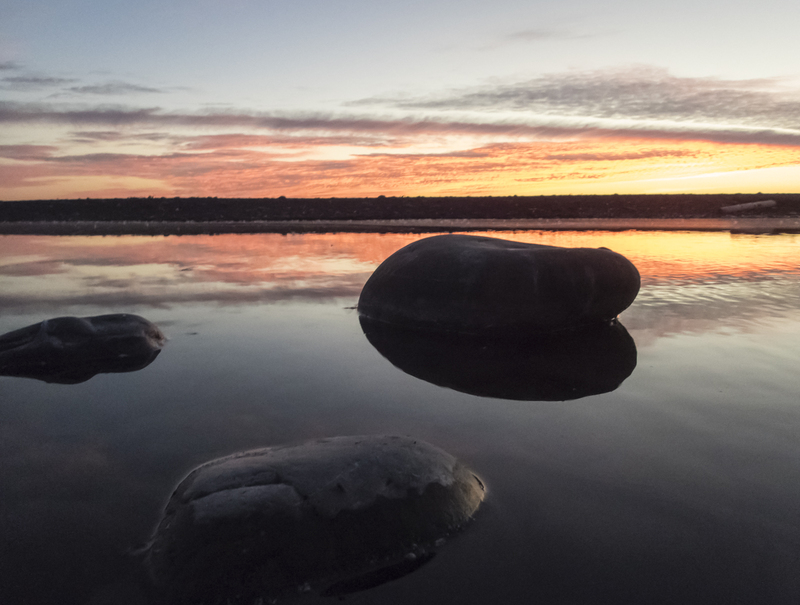 One reason for our early start was that hikers must pay close attention to the tides on this stretch of the LCT because there are a few stretches along the 25-mile hike that are impassable at high tide. 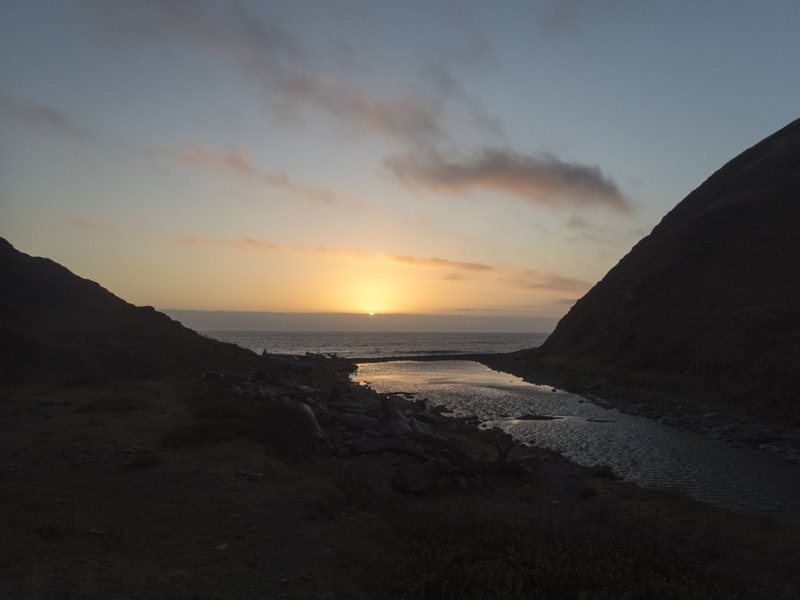 Two of the impassable stretches are each about 4 miles in length, so you need to plan your hike to ensure you can either get through them before the tide starts coming in, or you reach one of the campsites (along the many creeks that run into the ocean) inside the impassable zone. By starting early that day, we would be hiking much of the day before the tide reached a level that would halt our progress. The first couple of miles were pretty easy, except for the steady wind. As we neared the Punta Gorda Lighthouse (no longer active) we saw our first person on the trail. 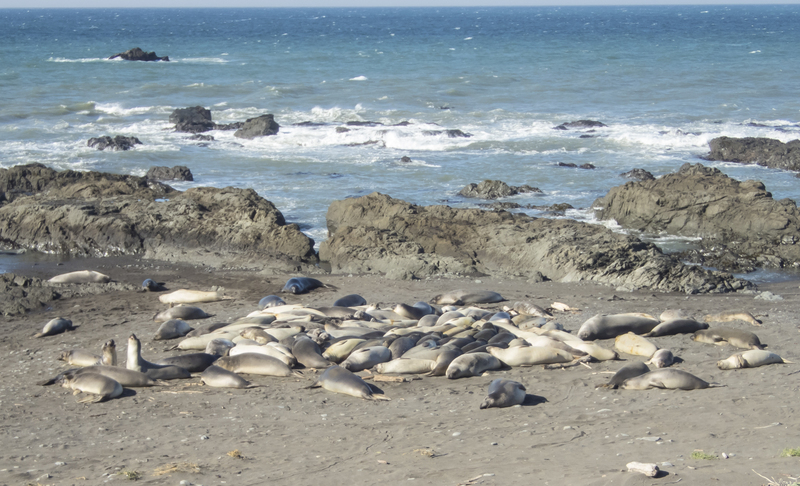 She was a day-hiker and was watching a group of over 50 Stellar Sea Lions that were hauling out on the beach. There are apparently some places that are better than others if you are hauled out, as there was a lot of pushing and chest bumping going on, along with their loud barking sounds. We were a respectable distance from the beach and on high ground, so we sat and watched the activity for about 30 minutes before seeking shelter from the wind in the aging lighthouse. After lunch, we pushed off again, hoping to get to a campsite inside the impassable zone before the tide came in too far. We reached our destination, Cooskie Creek, late in the afternoon. 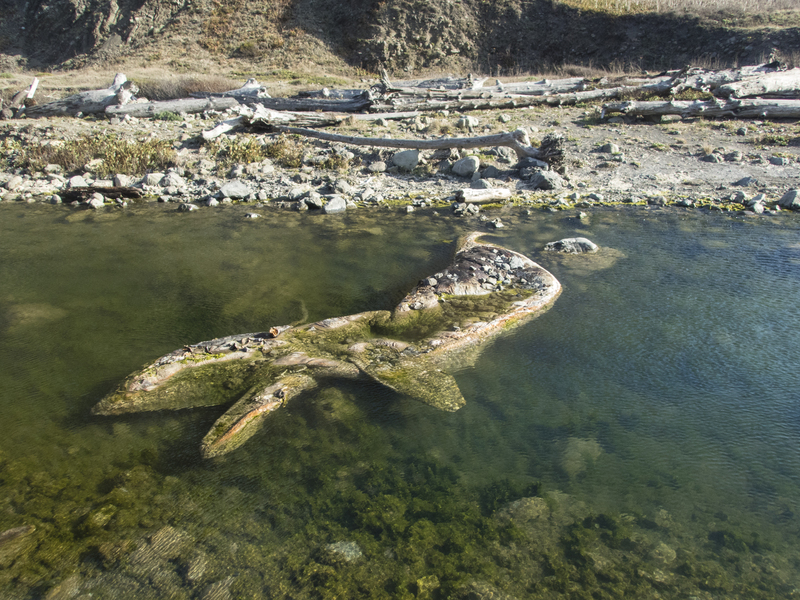 Our shuttle driver had told us about a dead whale calf washed into the mouth of the creek so we knew we were at the right spot as soon as we spotted it in a pool of the creek near the beach. The Bureau of Land Management (BLM) manages the Lost Creek Trail and encourages campers to use campsites that have obviously been used in the past in order to minimize damage to the habitat. 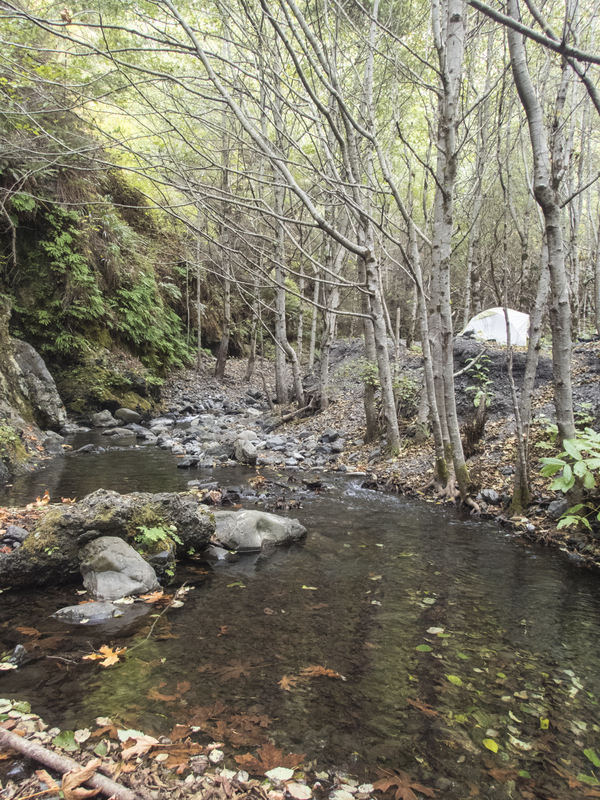 We found one upstream that was perfect, including a nice pool in the creek for bathing (in the ice cold water). As the tide reached the high tide mark and no one else had hiked in, we knew we would have the spot to ourselves for the night. 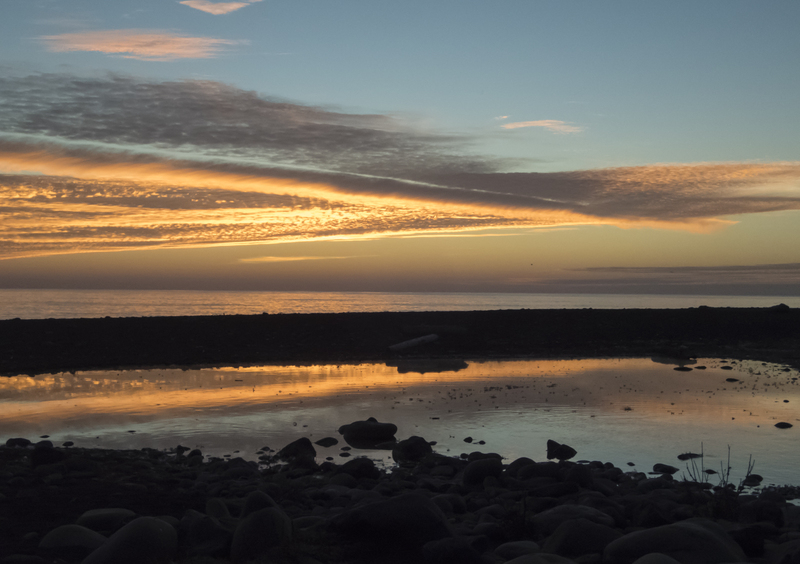 We settled in for our first of several freeze-dried meals (boy, have they improved over the years) and waited for another sunset over the Pacific. The next morning we waited until the tide started falling and headed out. Hiking conditions varied along the trail from deep sand (the worst from my point of view), to boulder fields, to the wonderful solid ground of the so-called flats. I strongly advise that anyone attempting this hike have at least one trekking pole. 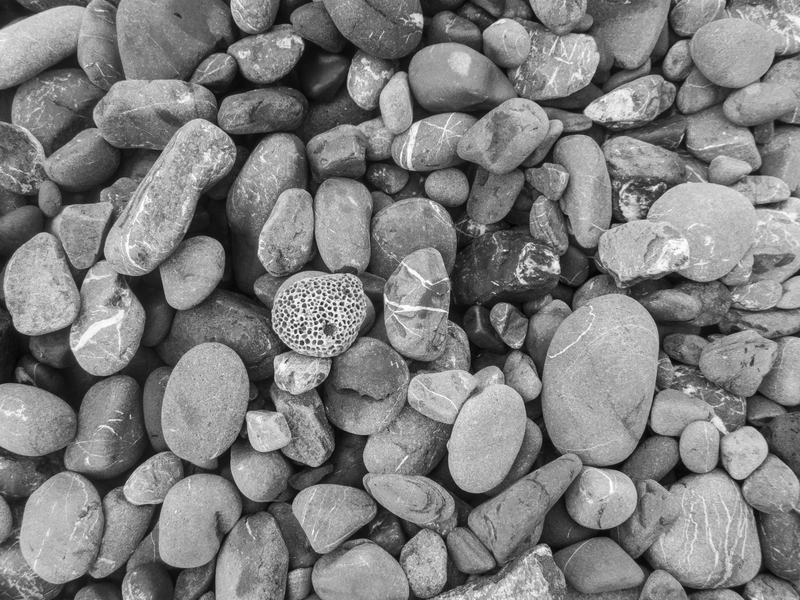 They are invaluable when hiking through the long stretches of rounded rocks on the beach. The flats are the easiest places to hike on the trip and were also the best for seeing wildflowers and wildlife (although the creek side campsites were also good for this). Since we were hiking and backpacking on this trip, I left my usual camera gear at home and brought my new (birthday gift) Olympus Tough TG-4. It is a compact, waterproof point-and-shoot that has a great macro and shoots RAW files in certain modes. I didn’t think we would see all that much wildlife to shoot, but that turned out not to be true. 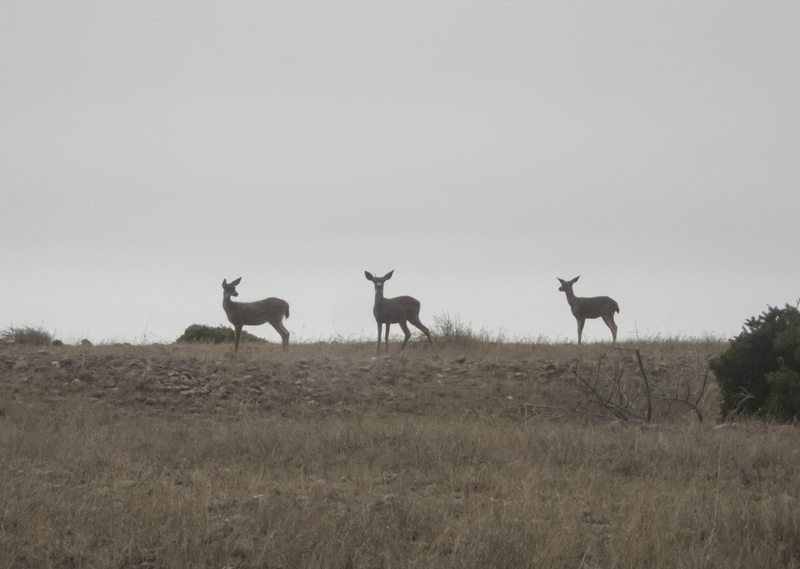 We saw a lot of Black-tailed Deer along the trail, as well as Stellar Sea Lions, Harbor Seals, lots of birds (including American Dippers along the creeks and a flock of Wild Turkeys at Miller Flats), two live whales, and several River Otter. 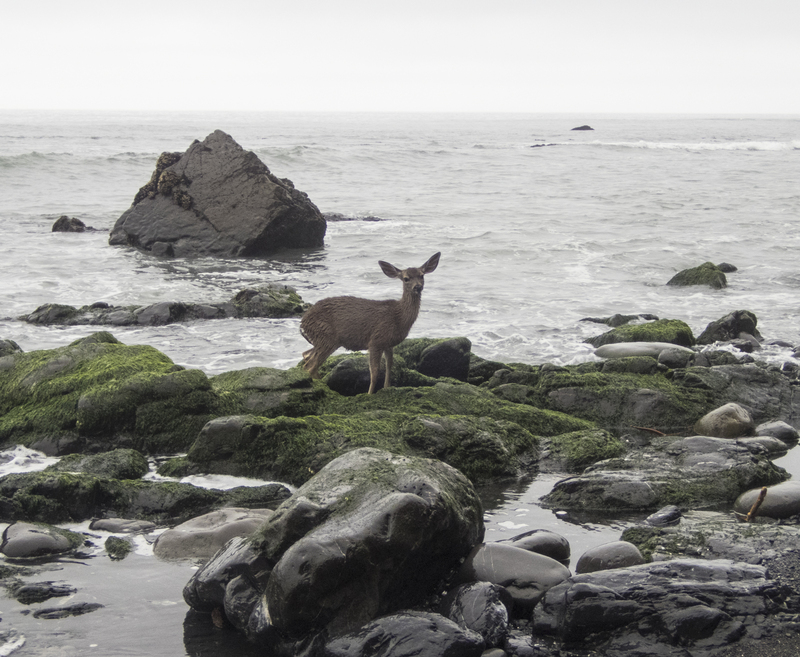 On one of the impassable at high tide stretches, we came across a small deer that must have been trapped on the beach in the last tide cycle. 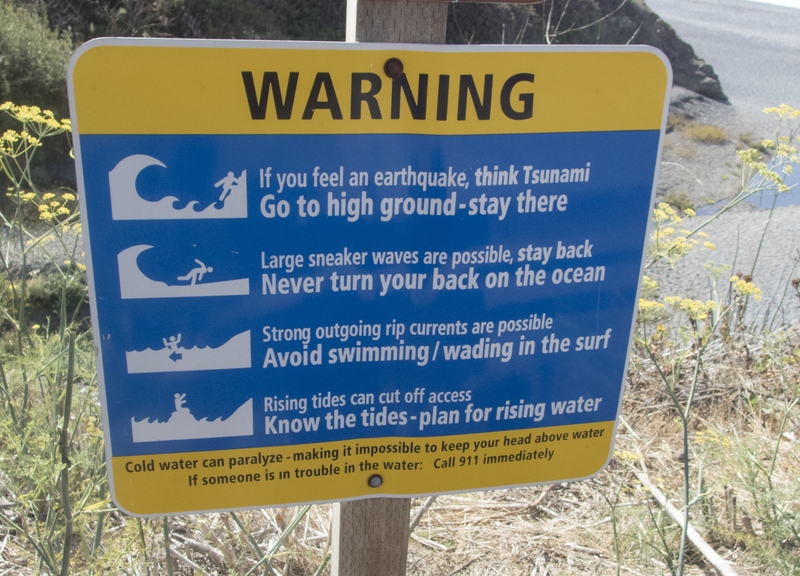 The obviously shaken (and wet and shaking) animal was in a location with steep cliffs bordering the beach making it next to impossible to climb to safety. It was quite a way back to the flats and I was unsure what was ahead, so we were hesitant to try to drive the animal out ahead of us. 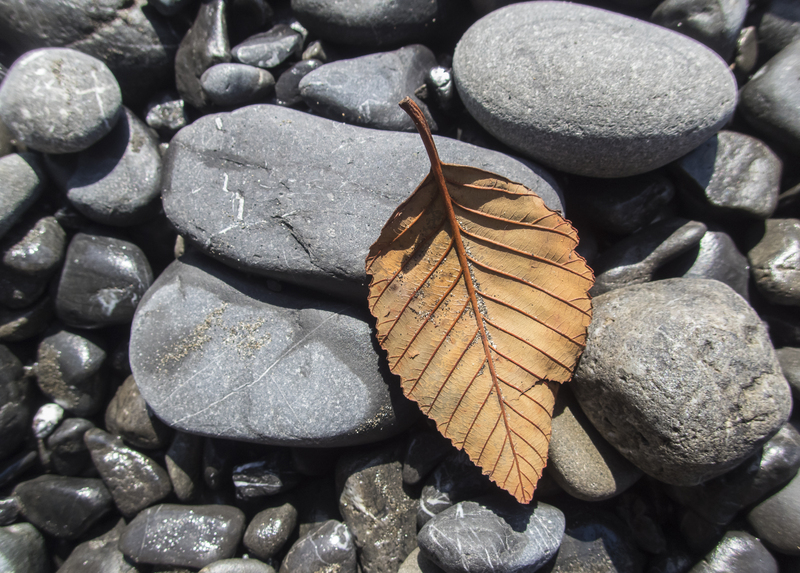 I moved closer to make sure it was not stuck in the rocks (it wasn’t) and we decided to leave it and hope it found its way out. That was a tough decision, but a group following us that we encountered the next day had not seen it on the beach when they passed, so it hopefully made its way to dry ground. 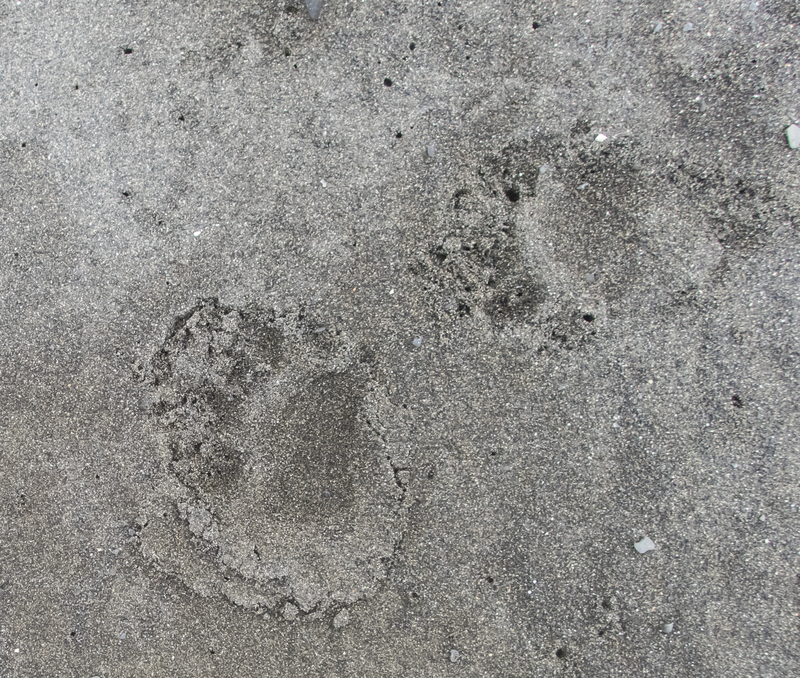 One of the wildlife surprises was the abundance of bear tracks along the beach. They were spread out over a large stretch of the trail and at one point there were two distinct sets of tracks, including one from a fairly large animal. It would have been great to see one out on the beach, but I am thankful we had no issues with them at our campsites. I see now why the BLM requires hikers to carry a bear canister with them for overnight trips (they can be rented locally). Many people do this trip in three days, but we had decided to take our time and enjoy the journey, so we planned on a five day trip. That also gave us a lot of flexibility in terms of campsite selection, and we managed to have the creeks all to ourselves each night. That probably doesn’t happen very often in the busier seasons. On our fourth morning, we awoke to some light fog moving in off the ocean, creating a magical, misty landscape for our breakfast. 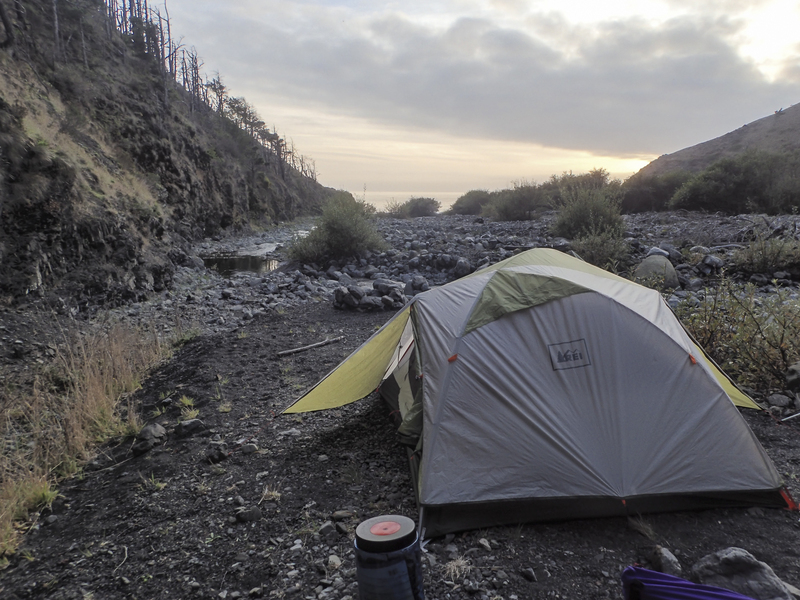 We debated staying the extra night, but our last camp was in a setting more reminiscent of a NC mountain scene than something less than a hundred yards from the Pacific surf, so we stayed. To make it even more special, a family of four River Otters were holed up in a log pile near the mouth of the creek, allowing us a few close up views as they settled in for the night. We ate dinner out on the beach and watched the sea and sky perform one last time – what a beautiful way to end a trip. The last morning we had to wait until the tide started dropping and we packed up one last time and headed out. 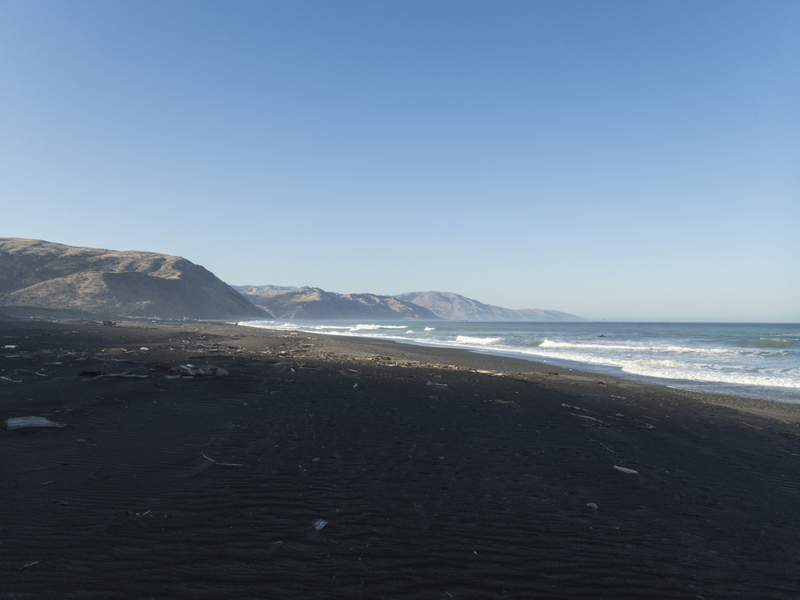 The black sands in the final couple of miles were challenging at times, but we could see scattered houses on the slopes of Shelter Cove and that was incentive enough to finish our trek. 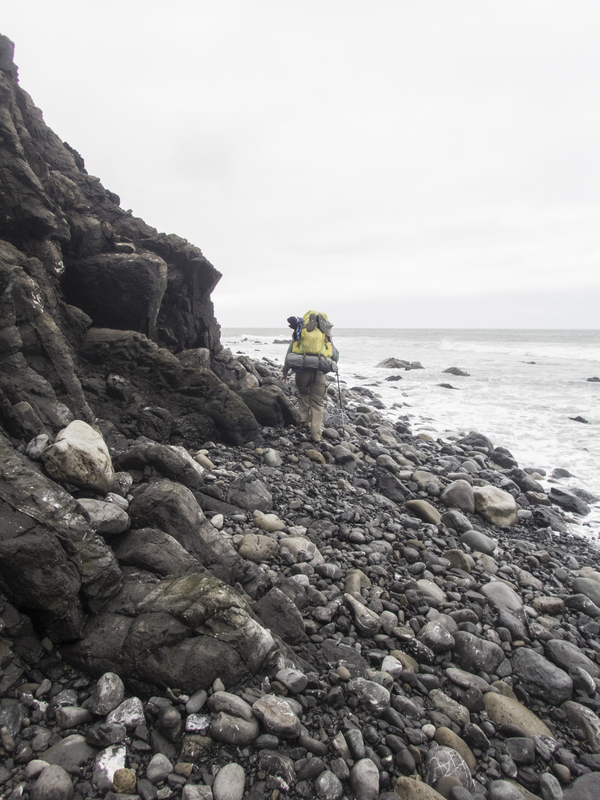 It had been a relaxing, occasionally challenging, hike along an incredibly scenic coastline. 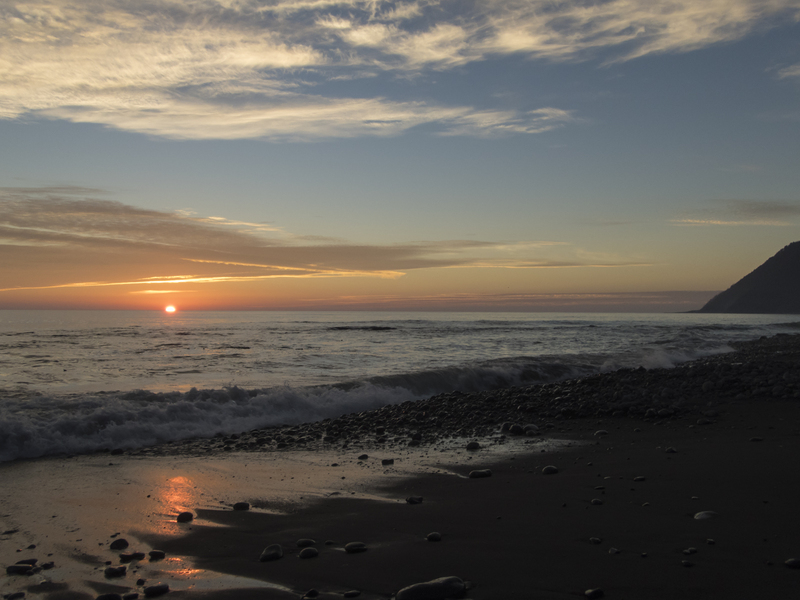 The weather had been perfect – cool, cloudy when it needed to be to shelter us from the sun, and full of beautiful sunrises and sunsets. 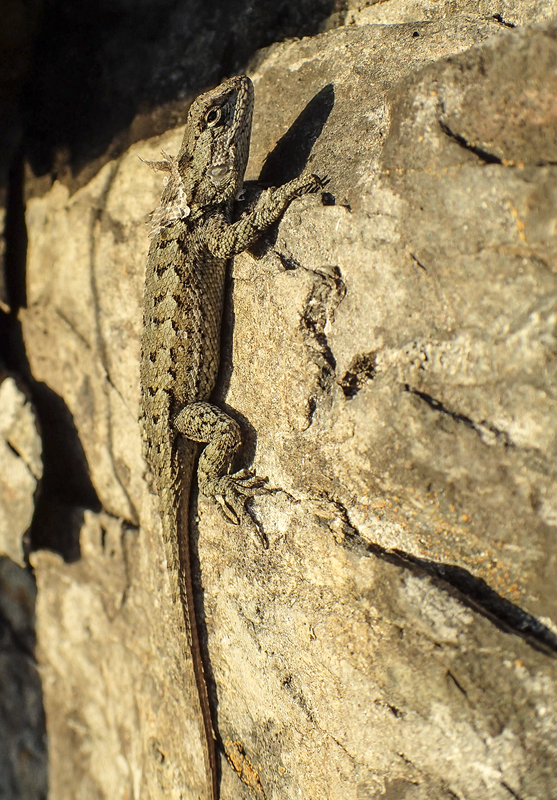 And the pace was such that we could appreciate the wildlife and small wonders along the way. Not a bad Plan B after all. 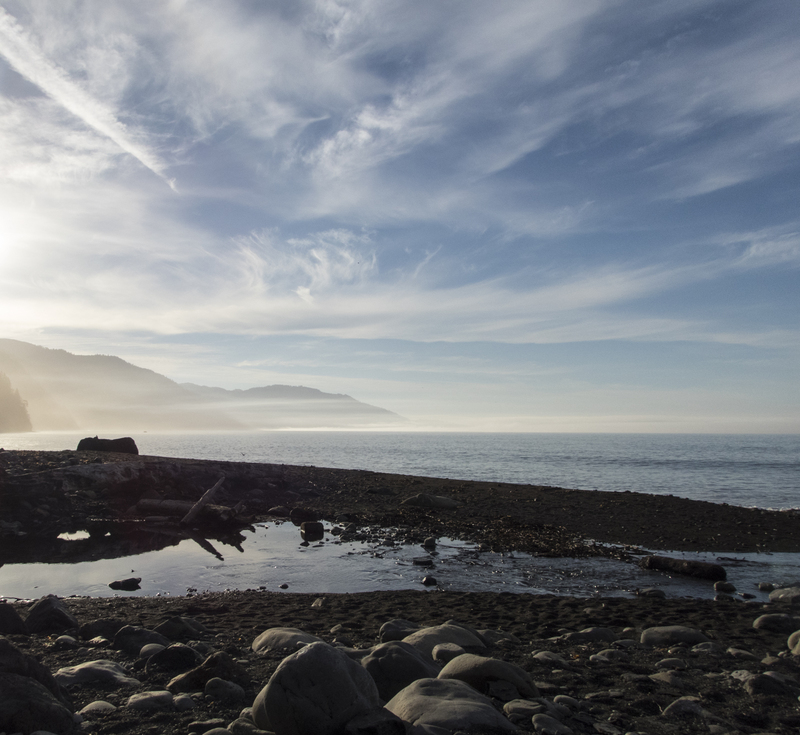 A few more shots from our hike along the Lost Coast Trail. There are a half dozen or so pieces of private property along the trail, some with nice cabins, and one with a beautiful home and grassy air strip. 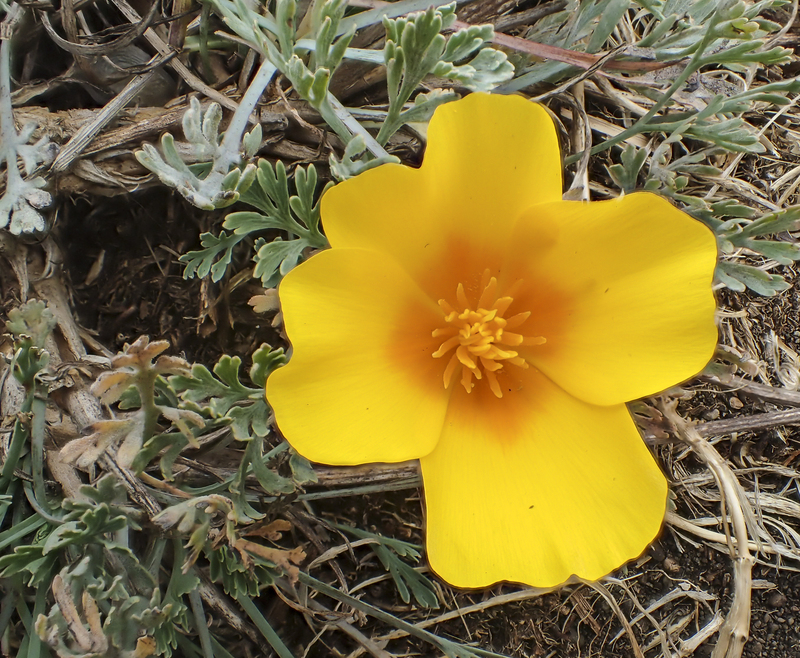 California Poppies brightened our way, especially along the flats. This giant stump is near the end of the trail. 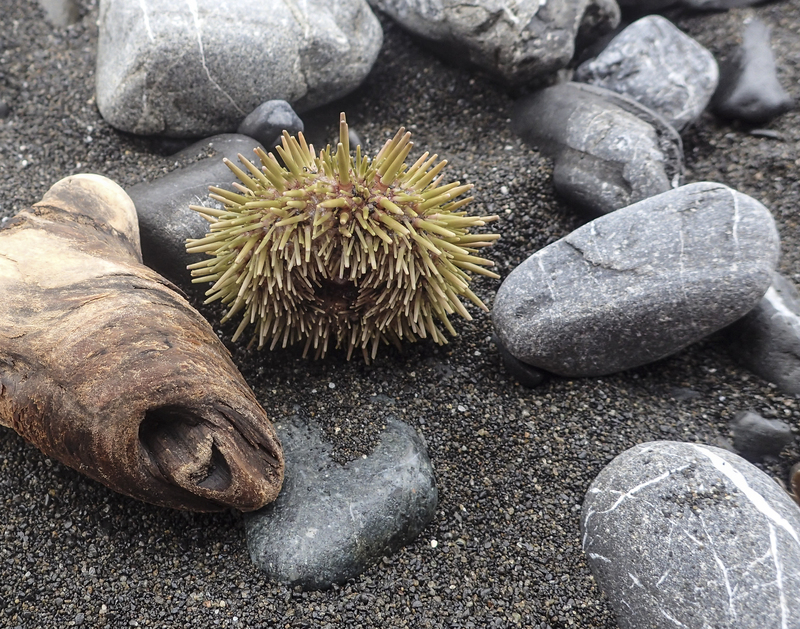 We found several species washed up on the beach along the LCT – sea urchins, chitons, a dead sea lion, and two dead whales. I had thought we were doing well and being tough on our 25-mile hike. 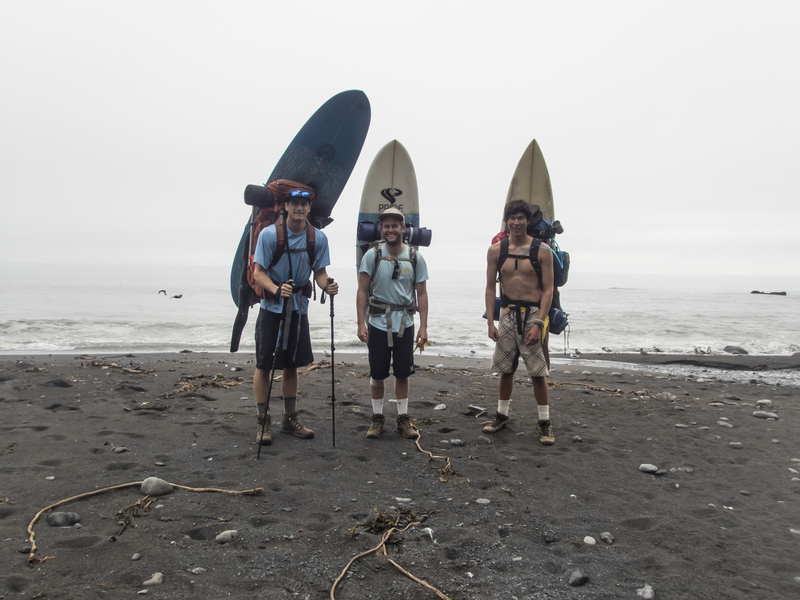 Then we met these guys hiking in to Miller Flats (about a 10-mile hike from the south) to catch some waves. On our return, I also read that John Muir considered 25 miles a nice day hike…oh well. 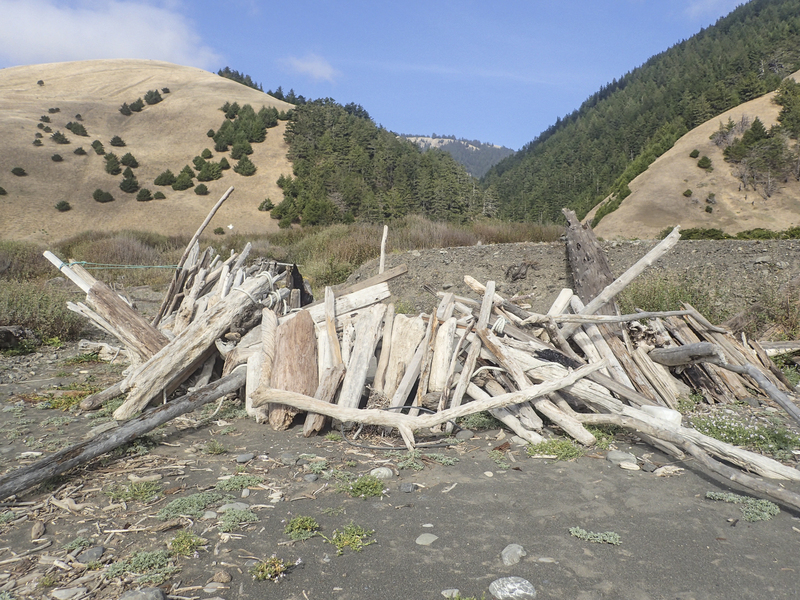 There are a lot of driftwood shelters that hikers have created at campsites along the trail. The BLM discourages this type of disturbance to the natural landscape. So do the rocks you struggle to walk over. Things you don’t have to think about when you hike the East Coast beaches. 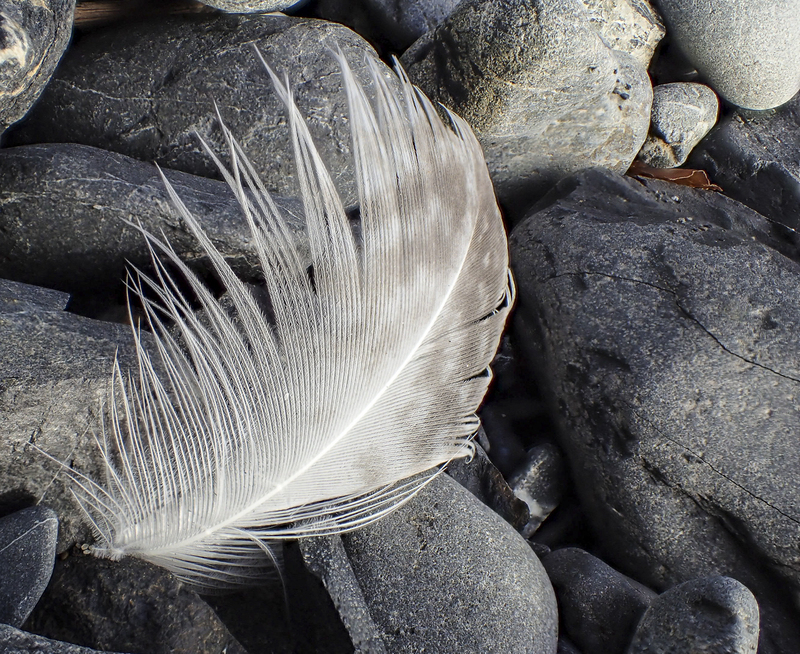 A gull feather on the beach. The final sunset on our hike. Only spread a fern-frond over a man’s head and worldly cares are cast out, and freedom and beauty and peace come in. 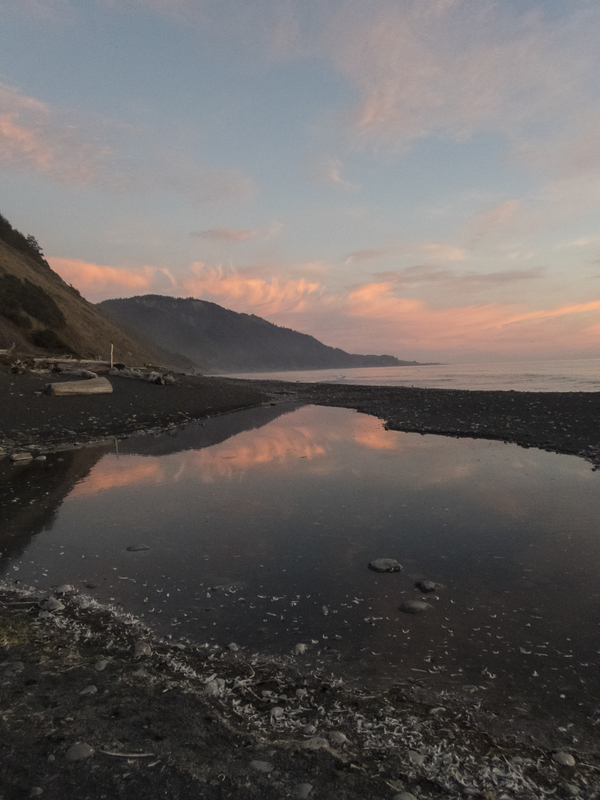 The first campground on our recent trip to the redwood forests was at Gold Bluffs Beach in Prairie Creek Redwoods State Park. It is a beautiful setting on the beach with a backdrop of high, gold-colored cliffs. 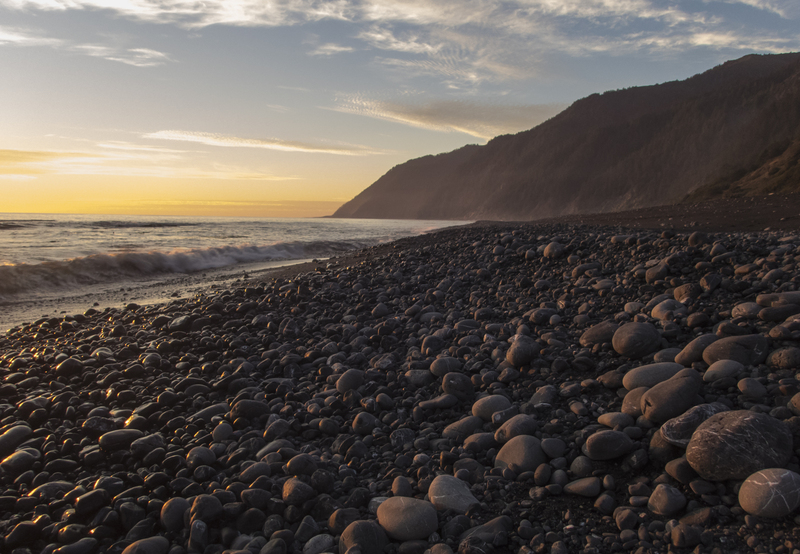 The setting sun showcases the yellow-gold color that gave these bluffs along this stretch of the coast their name. And, it turns out, there really is gold in them thar hills. 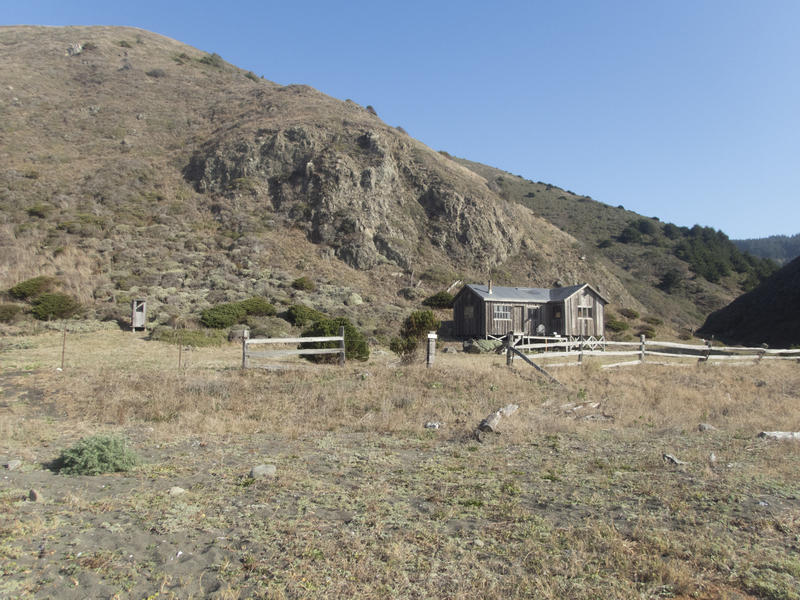 There was a gold mining operation in the area, off and on, from the 1850’s to the early 1900’s, with many attempts to extract the extremely fine gold dust embedded in the hillsides along the coast. 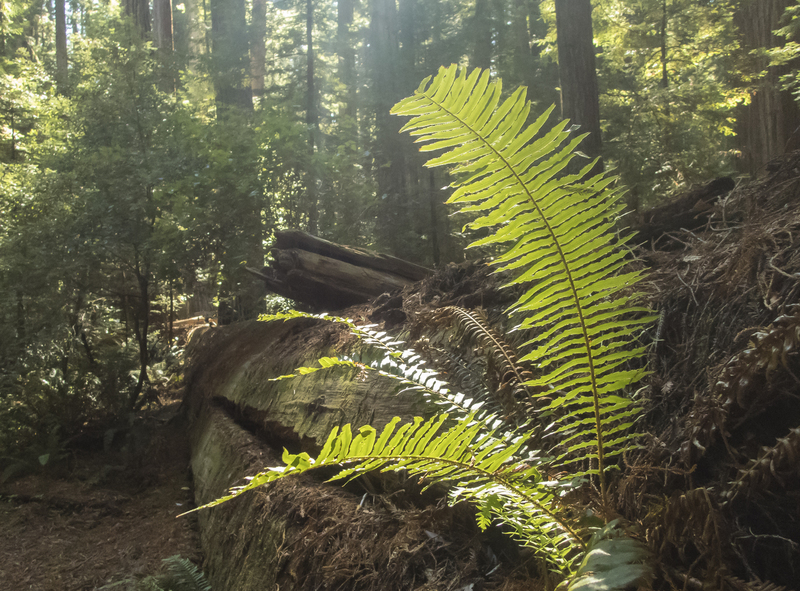 Eventually, the operation ceased and land was donated to the Save the Redwoods League in an effort to preserve the adjacent coastal forests. This park is home to a large herd of Roosevelt Elk. 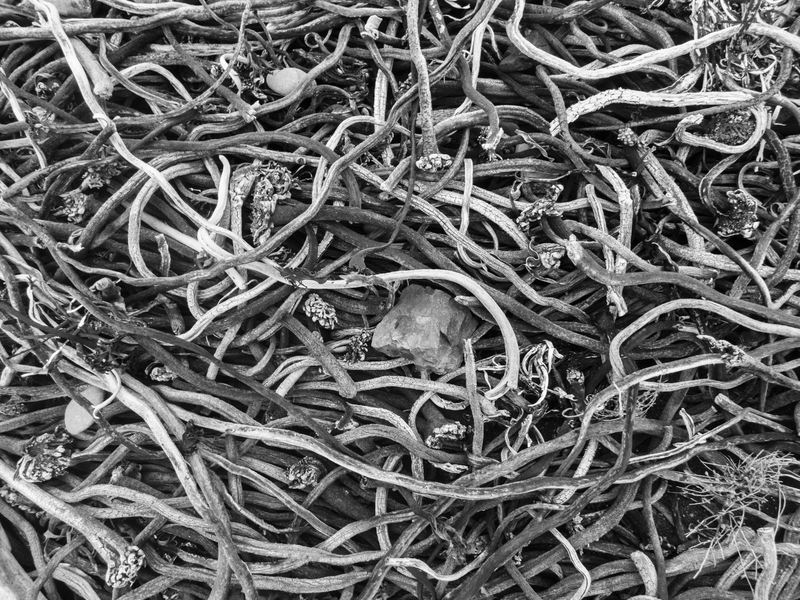 They can be found in an inland prairie area, in the forests (where they look tiny in the setting of the huge Redwoods), and, surprisingly, along the beach. 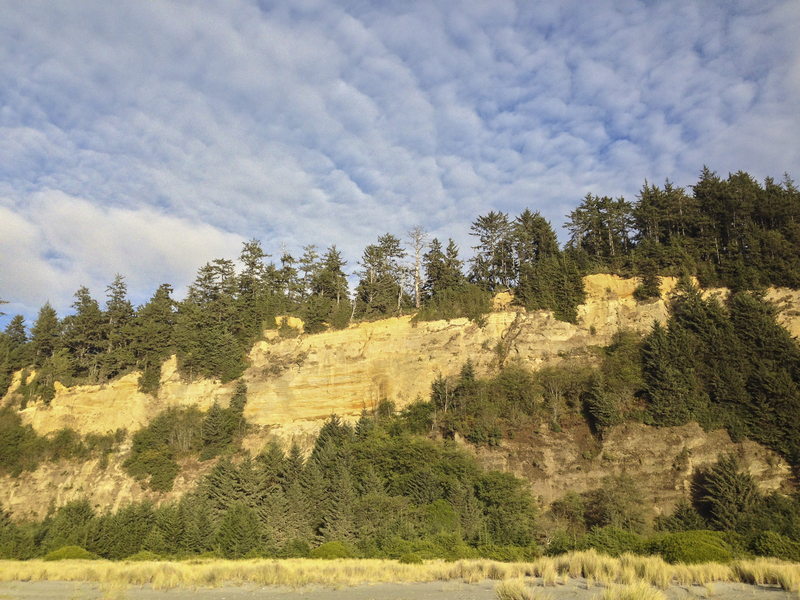 We started our morning at Gold Bluffs Beach by hiking down the gravel road to the trail head for Fern Canyon. 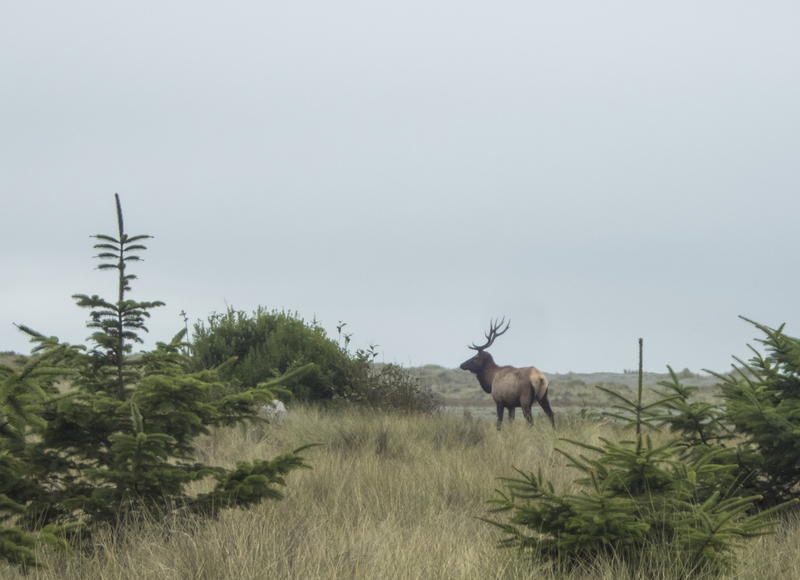 A couple of hormonal-charged bull Elk greeted us as they made their way along the dune line, thrashing the bushes with their antlers in preparation for a possible duel. We let them pass and then headed out on the trail. Our 10-mile hike started at one of the more popular sites in the park, Fern Canyon. I had seen photos of the site, but they don’t really prepare you for the magical nature of the place. We were lucky as there was no one else in the canyon when we entered, giving us a chance to walk in silence and to try to absorb the beauty of this place. 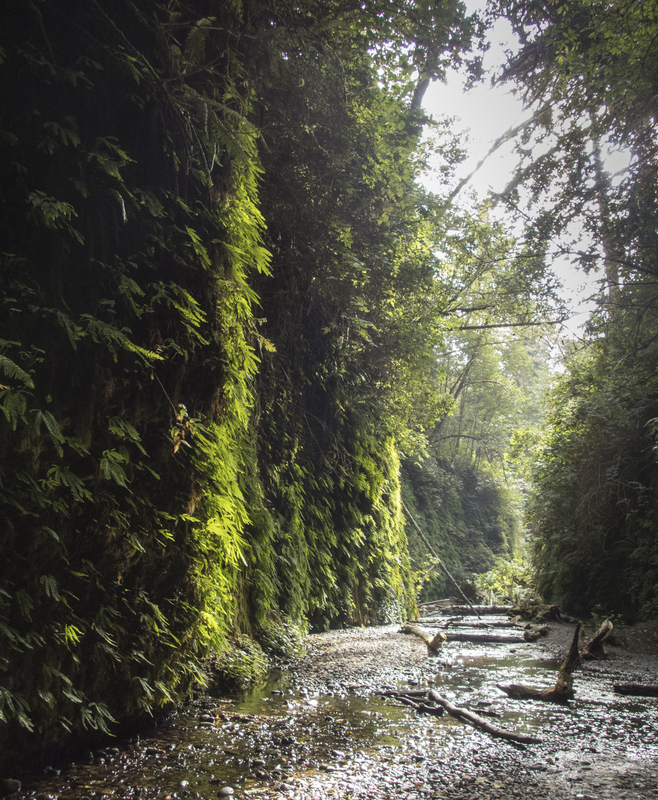 Fern Canyon is a narrow, long, canyon cut by the weathering action of Home Creek through the soft sedimentary rock. 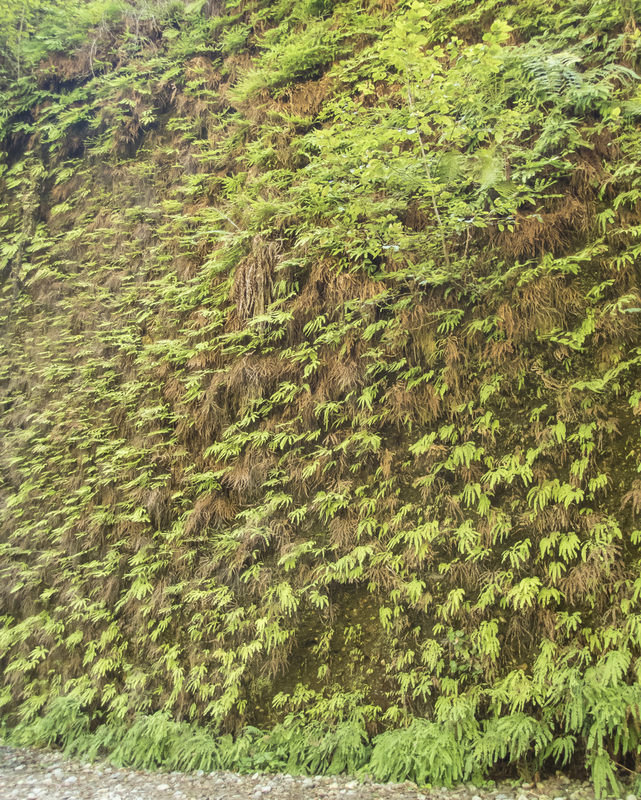 The walls rise straight above the flat creek bed for 50 to 80 feet and are festooned with a carpet of green – ferns, mosses, and small shrubs. As you stroll through, you can hear the water gurgling in the crystal clear creek waters, and you can catch the dripping sounds of water trickling down the canyon walls. 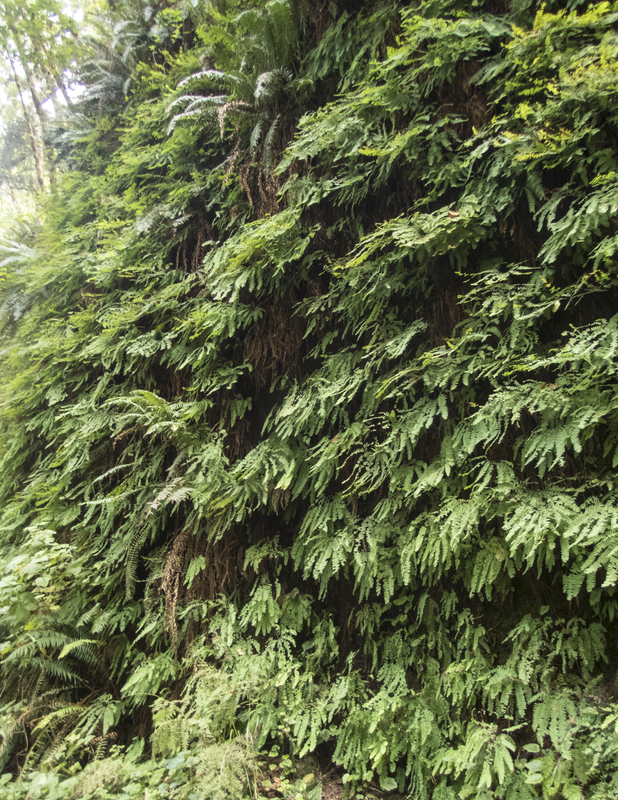 There are at least seven species of ferns forming a living wallpaper, the most common being the Five-Fingered Fern, a relative of our Maidenhair Fern. The canyon is also home to some interesting amphibians including the Coastal Giant Salamander and the Pacific Chorus Frog. 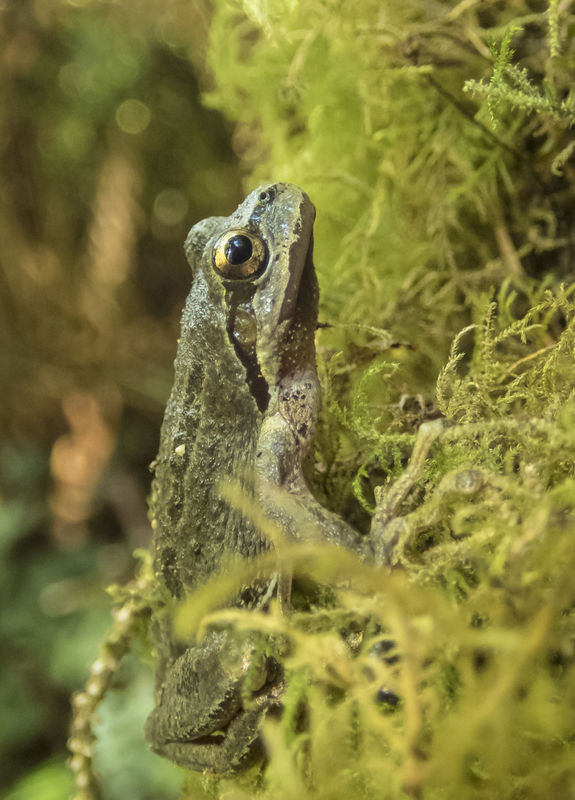 While we missed seeing any salamanders, we did find a chilled chorus frog slowly climbing a moss-covered trunk at the base of the canyon. 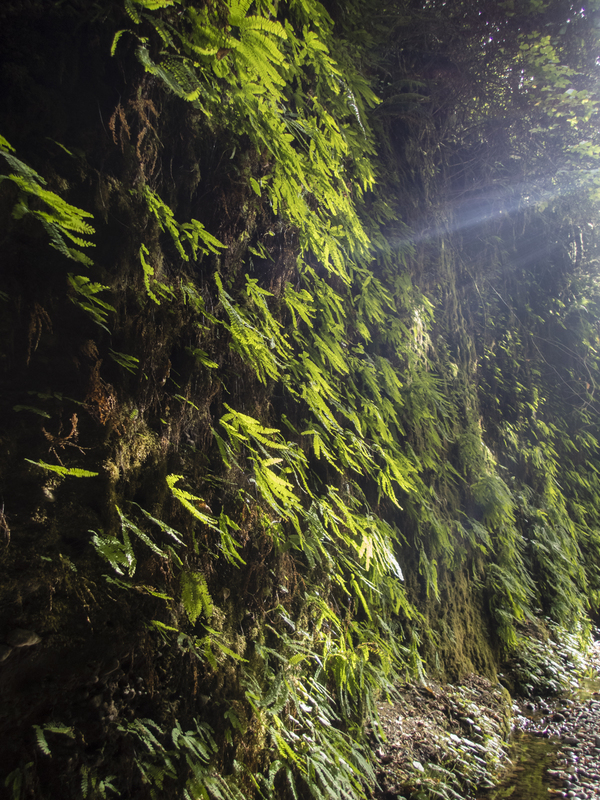 Fern Canyon is certainly a place you could revisit many times, in many seasons (be prepared to get your feet wet in all but the driest months). I would love to go back at different times of day to witness the play of light on the canyon walls. No wonder it was chosen as one of the backdrops for the movie, The Lost World: Jurassic Park, and a couple of other dinosaur-related films. It does make you feel as if you are in a different place, a different time, a world with the green filter turned all the way up. Come to the woods, for here is rest. There is no repose like that of the green deep woods. The original plan for the recent California trip was destination Yosemite, Kings Canyon, and Sequoia National Parks, in part to see the Giant Sequoia trees. With the fires, partial closures, and air quality issues, we changed plans and headed for the other big trees, the Redwoods. 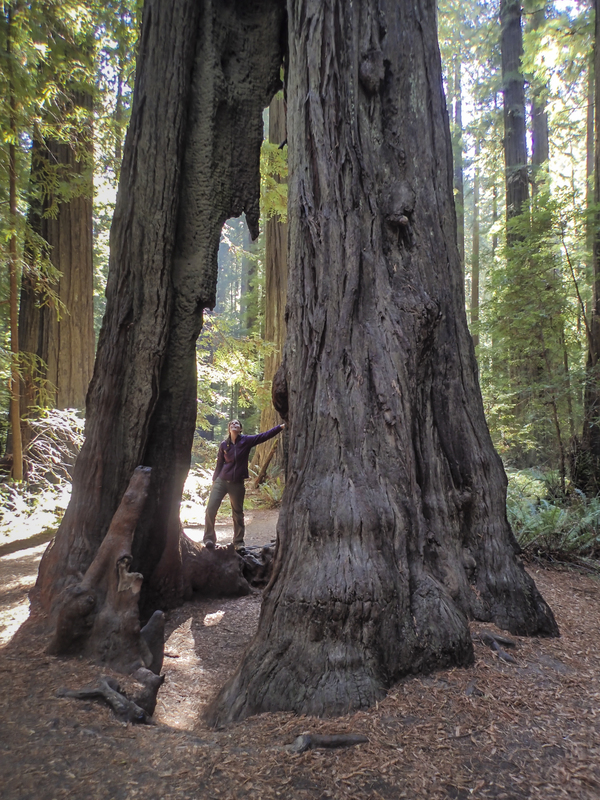 I had seen Redwoods once before on a visit to Muir Woods, just north of San Francisco. They are mesmerizing. But we wanted to see more, to walk without crowds in the company of these giants. So, the first part of the trip we headed north, up the Redwood Highway (Rt. 101). 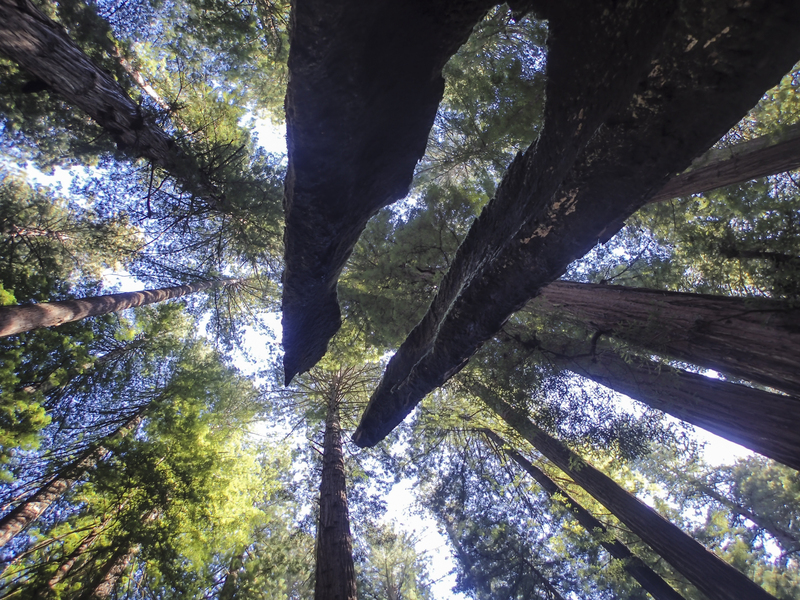 One of the highlights that is easy for anyone traveling north on 101 is a slight detour onto the Avenue of the Giants, a 31-mile side road that runs through magnificent groves of Redwoods. It is hard to imagine how tall these coastal Redwoods really are unless you have something for scale. 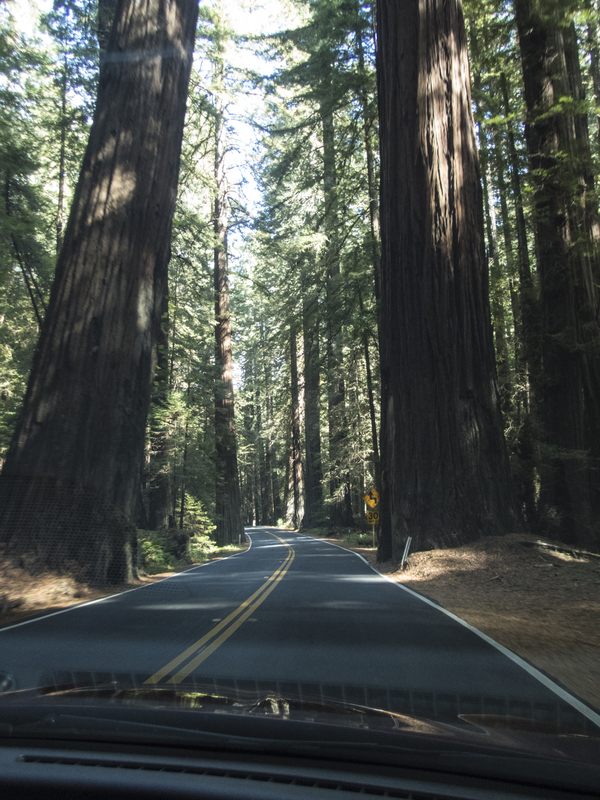 As you drive through the towering trees, the road ahead looks more like a paved path than a highway. Avenue of the Giants passes through Humboldt Redwoods State Park, home to the largest continuous old growth Redwood forest in the world. 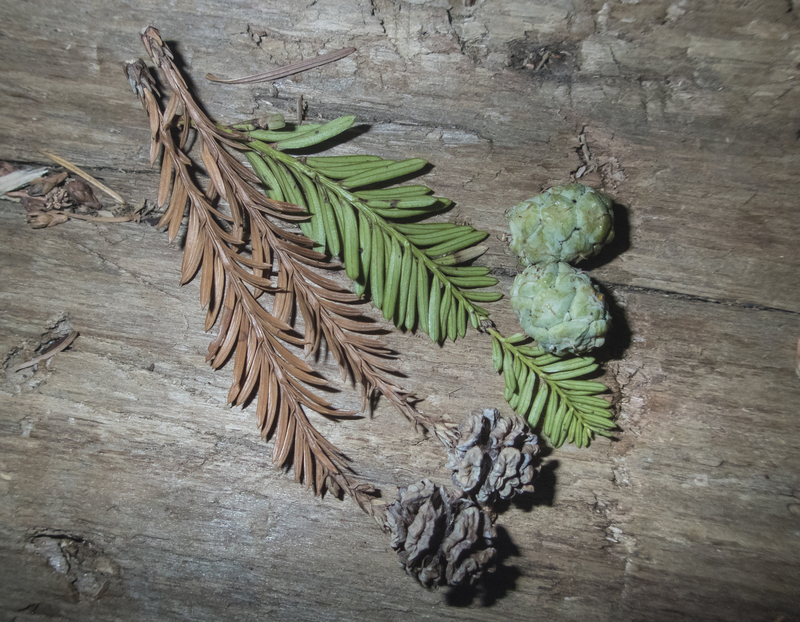 Redwoods, Sequoia sempervirens, are an ancient tree and were once found throughout much of North America. They are now restricted to a narrow band (varying from 5 to 20 miles in width) that stretches about 450 miles from from just north of the Oregon state line to the Santa Lucia Mountains south of Monterey, California. 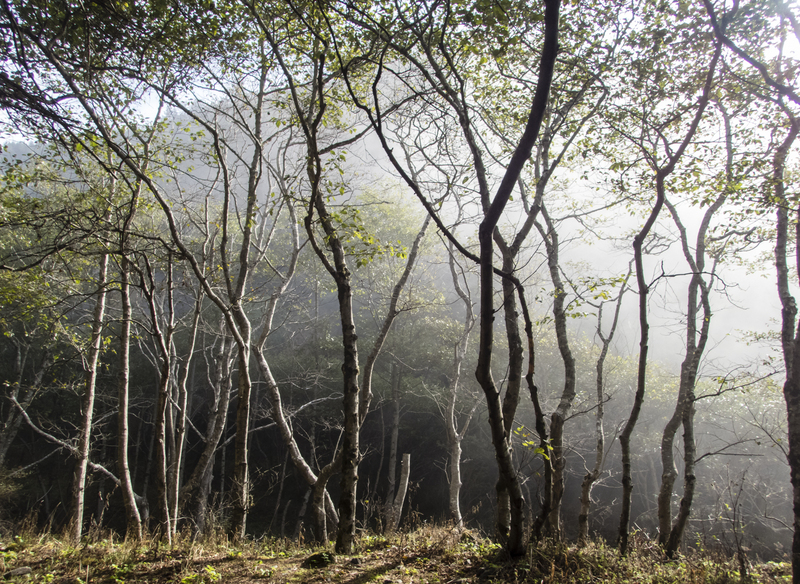 Until this trip, I had not realized how close we came to losing these magnificent forests. 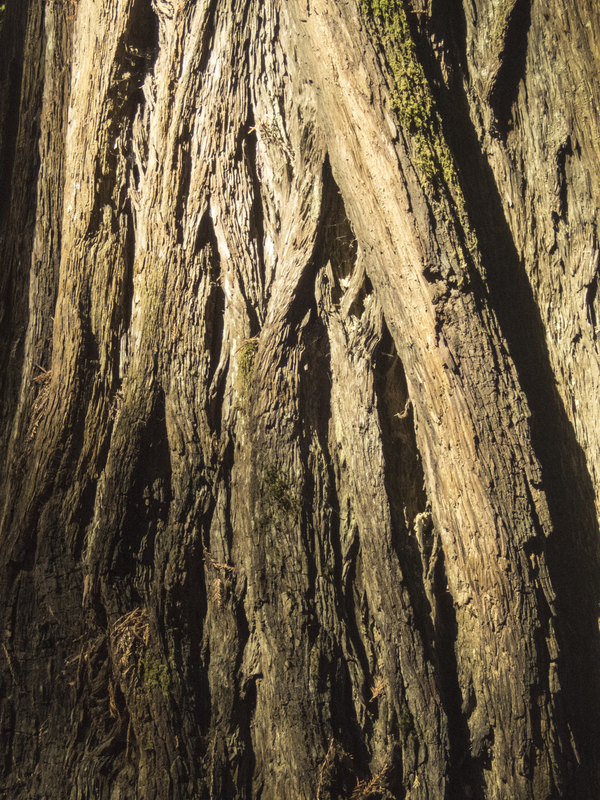 As soon as they were discovered by Europeans, the Redwoods were being cut for timber. And no wonder – the wood is very rot resistant, a beautiful reddish color, and one tree can supply an incredible amount of lumber. In fact, Santa Rosa is home to the Church of One Tree, a church built in 1873 entirely from the wood from one Redwood tree (275 feet tall and 18 feet in diameter). 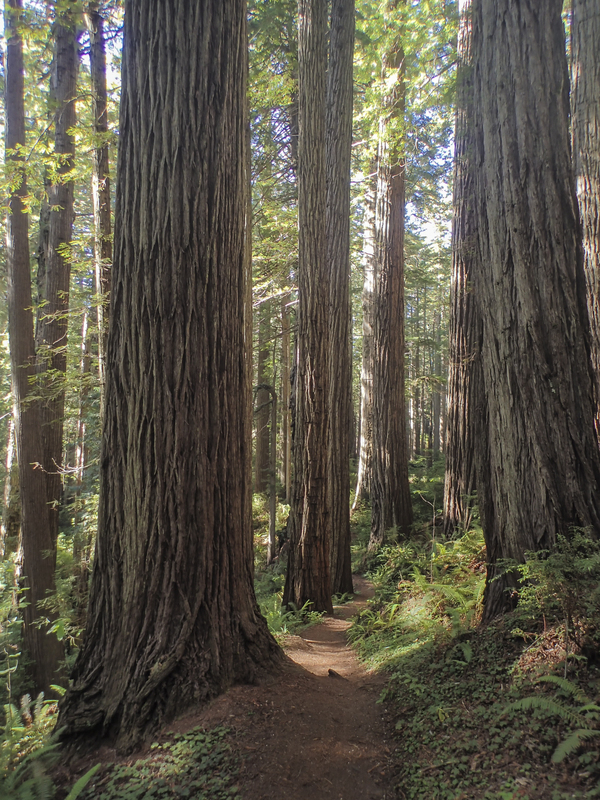 And a single tree in Humboldt County has an estimated 361,336 board feet, enough to build 22 five room houses. 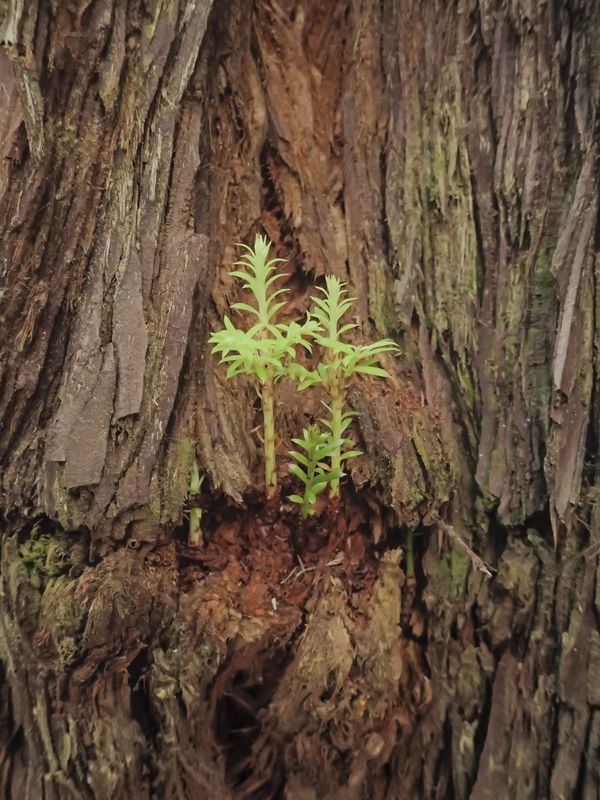 It was primarily through the efforts of private citizens, especially the Save the Redwoods League (created in 1918), that the coastal Redwood forests were saved from destruction. 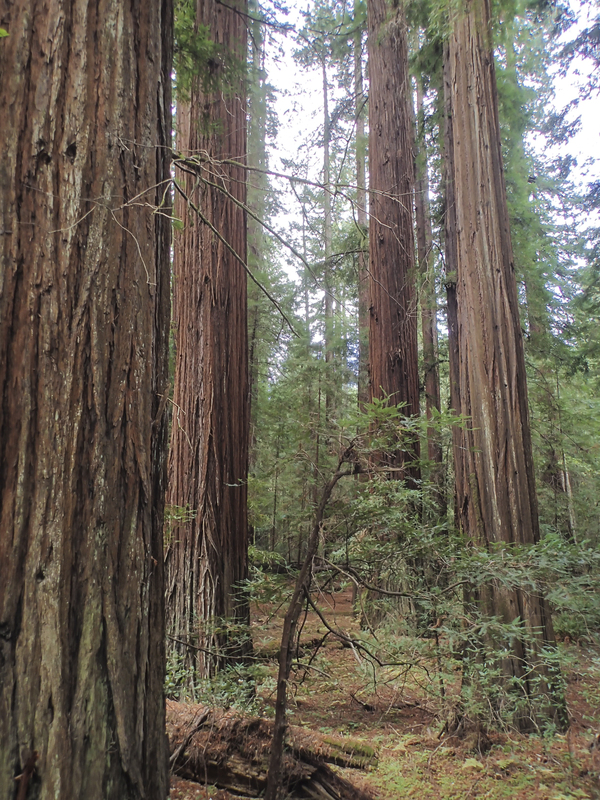 Of the estimated original 2 million acres of old growth Redwoods in California at the time of European discovery, only about 5% (120,000 acres) remains today. The more I learn about these trees, the more I understand how magical they truly are. 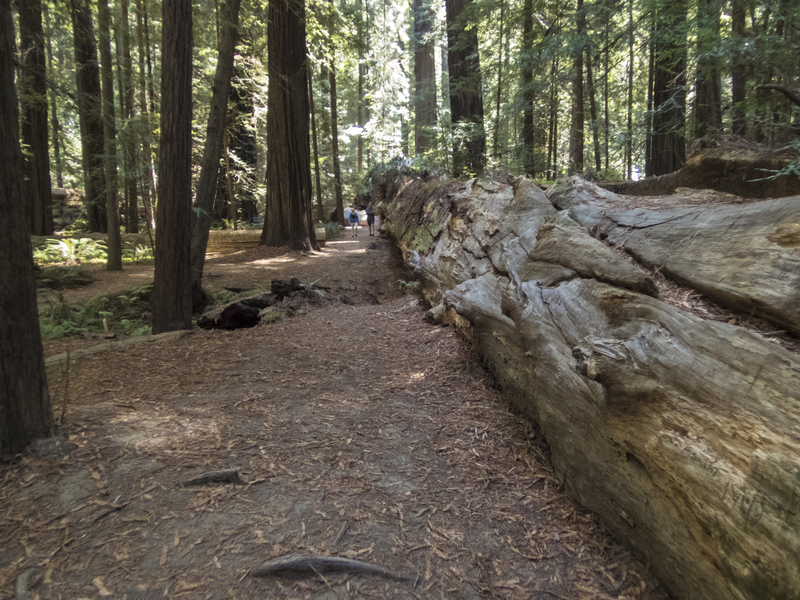 This log that fell in 2006 at Humboldt Redwoods State Park, is about 6 feet in diameter. 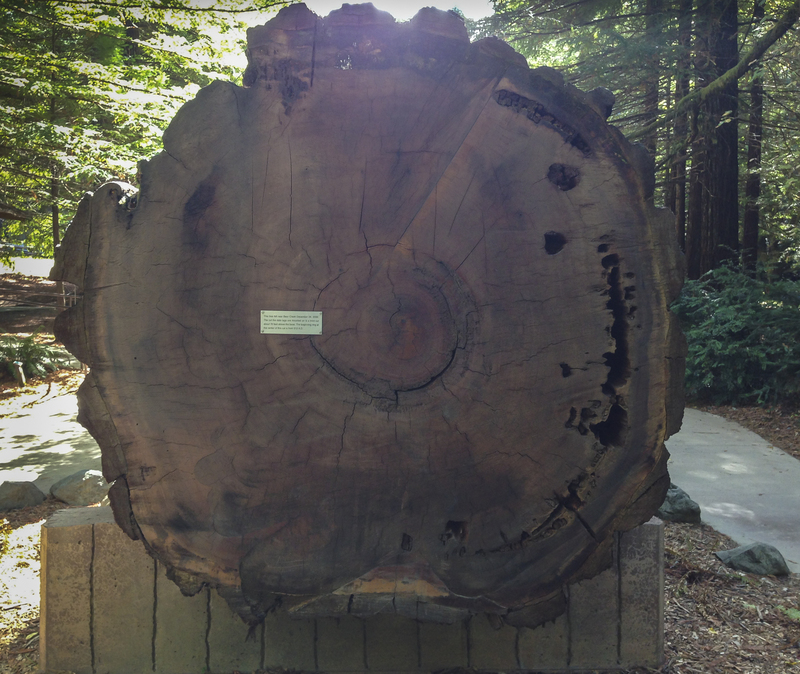 The cut was made at a point on the tree 70 feet above the ground, and the center ring is dated 912 A.D., making it 1,094 years old.